Take a look at these bedrooms for headboard ideas. A headboard can make or break the look of your bedroom. In most cases, it also acts as a feature wall so it's important to put more careful thought on how it looks like. 1. Redefining Orientalism by n0tch lifestyle + design. The flat's Oriental theme extends to the bedroom. Aside from the leather tufted headboard, the white panel with fish decors and mirror make this space a visual (and auspicious) spectacle. 2. Hill Crest by Sky Creation. Why go for a unicolour backdrop when you can use different shades of brown in a more playful layout? 3. Modern Landed by Neu Konceptz. This bedroom features a wooden headboard with built-in side tables. The cove lighting supplies the dramatic and hotel-like ambience. 4. Oui, Country Chic by n0tch lifestyle + design. If you have a specific interior style for your home, it would be ideal that your sleeping quarters adheres to the theme. This bedroom's cerulean upholstered headboard matches the home's country chic theme. 5. Regent Heights by Icon Interior. No headboard? No problem. 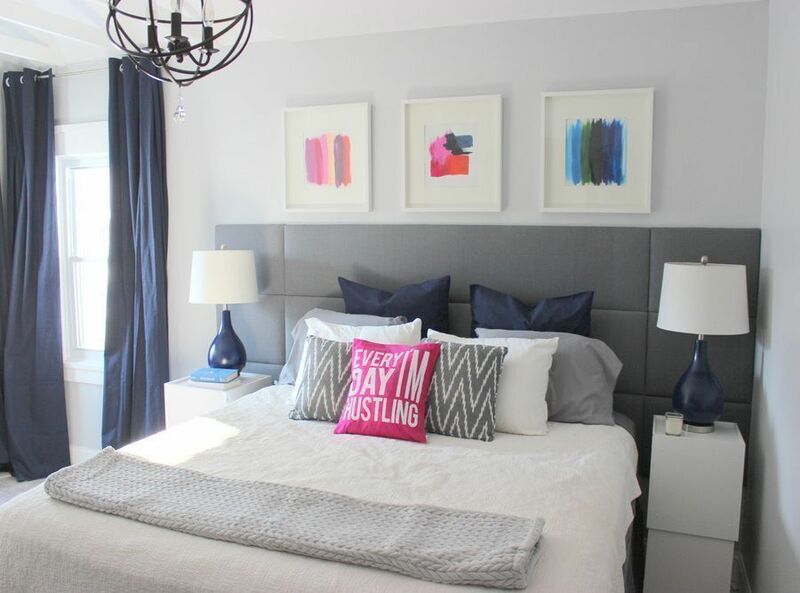 This ordinary bedroom gets an instant lift with a vibrant abstract artwork. 6. Livia Condo at Pasir Ris by Image Creative. Make a statement with an argyle-patterned upholstered headboard in dark and light hues of gold. 7. Pinewood Green by Loft 8 Ciseern. Maximise your carpentry contractor and ask him to build you a luxe-looking curved headboard with built-in tables. 8. Waterview @ Tampines by D'Planner. An ivory upholstered headboard is made more sophisticated with the addition of a black glamorous mirror. 9. Sunrise by Ciseern. Prettify the space behind the bed by wainscoting the lower part of the wall and painting the upper part with the colour of the sky. 10. The Beverly by Story of Us. This bedroom gets an extra boost of personality—thanks to the built-in wooden headboard and the Star Wars artwork on the coal grey wall. 11. St. Patrick's Residences by Project File. A wooden headboard that runs along the length of the room is complemented by a nature-inspired wallpaper. 12. Shelford @ Bukit Timah by Sans Trading. Inject unpredictable fun into your bedroom by choosing a bed with a unique headboard, like one with two individual headboards for each side of the bed. Share photos of your standout bedroom (and the rest of your home)—we might feature it! Email us at hello@cromly.com.